The Nautilus Group® is a unique organization that provides dedicated support in business and estate planning for a carefully selected group of financial professionals who work with high net worth families and business owners on estate, business and charitable planning objectives. As a Member Agent of The Nautilus Group®, I have exclusive access to an experienced team of professionals with credentials in law, taxation, accounting, business, insurance, finance and philanthropic planning. As an added service for his clients, and at no cost to them, Frank Dolph works with HR Workplace Services (HRWS). Through Frank's affiliation with HRWS, his clients are able to get all of their group benefits questions answered. HR Workplace Services is an international Professional Services Consultancy that partners exclusively with the preeminent insurance brokerages across the country, to offer benefits not offered elsewhere. The firm provides a vast array of pro-active, strategic Human Resource Consulting, Document Preparation, Compliance and Risk Mitigation, Training and Outsourcing services to their Benefits and P&C clients. The HRWS Practice Areas help our partners to remain “Best In Class” in their respective markets by allowing them to be the single point of value as it relates to Human Capital. Frank works with clients of our broker partners from as small as three employees to over 200,000 – in all 50 states and over 20 countries – in virtually every business segment. HRWS is dedicated solely to the insurance industry. Nothing is offered outside of the brokerage relationship. If a client of one of our partners ever leaves their firm, our services end for that company. From initial company inception, the core philosophy behind HRWS has been to strengthen and foster loyalty between brokers and their clients. In addition, the Team at HRWS becomes actively involved with brokerage personnel during the prospecting and renewal process. We have tremendous national and measurable success in assisting our partners with keeping and writing accounts. Client acquisition and retention for our partners is a significant part of the HRWS ROI. HRWS is not owned or operated by New York Life Insurance Company. Frank does not receive any compensation from HRWS. New York Life has a long and proud history of financial strength. It is one of the largest life insurance companies in the United States and is a leader in the financial services industry. New York Life has met always its commitments to its policy holders and is a mutual company, which means it's owned by its policy holders. The company serves its customers with insurance and other financial products, as well as providing Corporate Life Insurance (COLI), Bank-Owned Life Insurance (BOLI), and long-term care insurance. New York Life Investment Management LLC (NYLIM), an indirect, wholly owned subsidiary of New York Life Insurance Company, is a premier institutional investment management firm. NYLIM is an integrated asset management enterprise serving a variety of sectors—namely retail, institutional, bundled defined contribution and defined benefit, and guaranteed products. 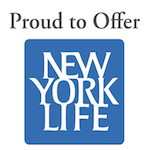 New York Life Investments ranks among the largest asset management firms in the United States. Through its multiple boutique investment structure, the firm delivers investment performance through an array of products designed for both institutional and retail clients. Mainstay Investments, a service of New York Life Insurance Company, is a provider of multi-boutique investment solutions. By providing solutions for clients through Mainstay Funds and Investments, Frank provides comprehensive tools and access to a large variety of investment opportunities to his clients.